Virtualization powers digital transformation, but siloed infrastructure for backup and recovery, test/dev, analytics and other secondary workloads hinders progress. Protect and extend your Nutanix AHV environment and investment with Cohesity. Deploy trusted hyperconverged architecture to eliminate complexity and operational inefficiencies stemming from point products. Leverage the tight integration between Cohesity DataProtect and Nutanix AOS, Prism and AHV to enjoy the simplest, most efficient, reliable, and fastest backup and recovery possible. Replace point solutions with Cohesity’s end-to-end platform for data protection and cloud integration. Choose the right approach for your business with recovery options ranging from whole virtual machines (VM) to vDisk. Recover AHV VMs to the original source or other locations. Improve administrator-to-system ratios and keep IT in control of secondary data with Cohesity's single user interface (UI) and policy-based automation. Speed recovery point and recovery time objectives (RPOs and RTOs), going from days down to sub-five-minute recovery. Bridge islands of secondary data by leveraging Cohesity’s hyperconverged architecture and unified interface. Ensure high-availability with no single point of failure while scaling performance and capacity linearly. Eliminate expensive forklift upgrades and give your team more time to innovate. Take advantage of Prism and Cohesity integration to automatically register all AHV vDisk objects. Assign simple SLA policies to VMs or groups of VMs in the Cohesity UI to automate data protection and recovery. Consolidate backups, files, and test/dev copies in one software-defined solution, reducing data center space and shifting capital to operating costs. With automated policies, discover and protect the VMs as the VMs come online. Eliminate manual intervention and streamline operations, while being always protected. Reduce data footprint with global deduplication across multiple workloads throughout the cluster. Whether in the cloud or on-prem, take advantage of Cohesity's Google-like wildcard search to quickly search and recovery VMs. Monitor capacity utilization and trends at the cluster, VM, and file levels to better plan for future capacity needs. Build a multi-cloud data fabric to support disaster recovery, test/dev, and application migrations across public clouds. Extend to all leading public clouds for long-term archival, tiering, and replication using the Cohesity DataPlatform. Provide application developers with access to zero-cost copies of your data to speed test and dev processes, accelerating discovery. Perform custom analytics on your protected data directly on the Cohesity cluster without having to copy data to a separate analytics cluster. Use Cohesity’s native-cloud integration to accelerate application development in Nutanix AHV environments by provisioning test/dev environments in the cloud from your backups. When ready, move your application back on-premises again. Consolidate your backup data on a scale-out, globally deduped solution. 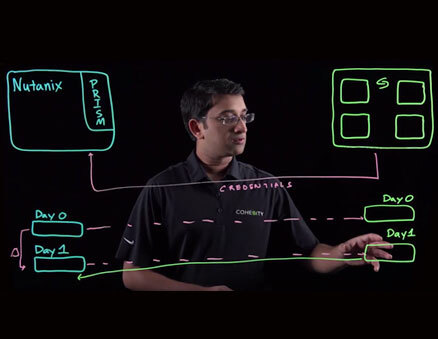 We took a decision to change to a fully hyperconverged infrastructure and are in the process of moving to Nutanix... There are far fewer points of management. Previously, we had SuperMicro JBOD and Quantum tape to deal with. There were lots of things that could go wrong and needed to be looked after. Upgrades were very disruptive. If we didn’t do Cohesity and stuck with what we had we would have spent £300,000 in replacing the SAN and on upgrades.